At Whitfield Architects, we not only care about designing homes you can feel proud of, but also providing a genuinely useful service. 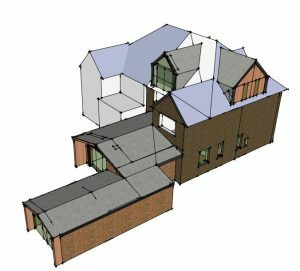 We’ll work with you to create designs that reflect the way you want to live; obtain the necessary local authority approvals such as planning permission and building regulations; and provide support during construction. As an independent family business, we enjoy helping others create homes they love – not least because we’ve been through it ourselves. We’re seasoned self-renovators, so as well as helping produce the right design for you, we can offer a personal insight into the ins-and-outs of the process. Our services include finding solutions to layout challenges and advising you on the most efficient way to approach your project. Got questions? Please get in touch. Our founder Mark Whitfield is a chartered architect who has designed and overseen the building of numerous houses, apartments and period restorations, for both private individuals and development companies. Take a look at our projects to learn more about our experience. And finally, we won’t waste your time or money by pushing you into something you don’t need. So if planning permission isn’t necessary for your kitchen extension, we’ll say so. And if it is, we’ll give you all the support we can.